The Enterprise has sent an away team down to... a planet... for some reason. When they fail to report back in a timely manner, Kirk becomes concerned. When one member of the team is beamed back dead, Kirk must act. Can Kirk, Spock and McCoy unravel the mystery and save their fellow crewmates from a wizard and his familiar? 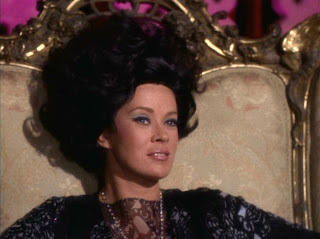 Matthew: Well, we've come to the "Halloween episode" of TOS. Written by Robert Bloch, who also wrote "What are Little Girls Made Of" and "Wolf In The Fold," it contains the germs of some decent sci-fi ideas, but has some serious issues. It's clear that Bloch wanted to work in some pet theories, such as Jungian "racial subconscious," and the sympathetic magic of George Frazer's Golden Bough . These ideas are treated seriously, when today they're looked at as the sort of "mumbo jumbo" that Kirk labels their setting. Kevin: I have a confession to make. Prior to sitting down to watch this episode for the purposes of reviewing it for this blog, I had never seen this episode before. I know. I'm shocked too. Somehow, this one just never made it into the syndication rotation in my childhood. I can't imagine why. Matthew: More problematic is the portrayal of women in this episode. Sylvia, the female alien, is portrayed as someone who is overwhelmed by the temptations that sensual pleasures offer. The problem is that there is a clear implication that it is being incarnated as a woman that leaves her subject to such temptations. Kirk, of course, uses his sexual magic on Sylvia for the sake of the mission. As problematic as this is, it is then undercut by the conclusion, in which the aliens are actually corporeal beings, who presumably would have some sensual means of interacting with their environments. It would have been better if the creatures had been non-corporeal, then the sensation thing would have made more "sense." We could also have been spared the bad puppetry effects and just gotten a green blob or two. Kevin: I agree. This goes beyond the normal "It's the 60s" excuse for background misogyny. This is just plain old "Women are the root of all evil" foreground misogyny. All we were missing is some reference to Eve and the Garden of Eden. Those issues aside, this episode was still just plain boring. Given the absence of credible motivations and back stories for the antagonists made the pacing really slow. The ending was also out of nowhere. He destroyed a table, and therefore the whole illusion? Okay...I guess. Whatever. It's not like I really cared at this point. It's an ending, and I'll like it on that basis. Matthew: Some economics notes: Precious gems are no longer valuable, as they can be manufactured by the barrel full on the Enterprise. This is interesting, but at least somewhat contradicts the episodes "Devil In The Dark" and "Mudd's Women," in which rare minerals are still valuable enough to mine on dangerous planets. Perhaps some minerals are manufacturable, others not. Also, we get a line from Lieutenant DeSalle, in which he says he'll "bet you credits to navy beans." 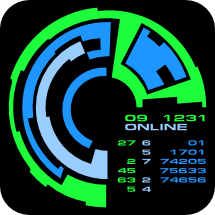 So here is another intimation of some form of Federation currency, in the 23rd century at least. Matthew: Brief note: I enjoyed very much the line "Don't let her touch the wand, captain." Heh, heh. Matthew: All the actors give it a game attempt, even with a pretty bad script. Kirk and Spock have some nice comedic moments, mainly due to Spock's witty asides. Shatner seems suitably annoyed and upset by the aliens' manipulations. I must say, however, that George Takei is not the best action hero. Just what martial art was he engaging in, anyway? Kevin: I have to say, I think there are really few instances in all of Star Trek when you could tag a lead actor for phoning it in, and that's certainly to their credit. I agree that Spock's comments, particularly about the wand, saved this episode from being truly Apple-level unwatchable. Matthew: I'm torn on Antoinette Bower's Sylvia. She's just... not very attractive here. To be sure, she is not aided in the slightest by the horrendous outfits she's placed in, the terrifyingly ugly wigs she is forced to wear...On the other hand, her performance is actually pretty good. As sexist as her character is written, she acts it to the hilt. Kevin: When she was transforming into other women...eep. That platinum wig with the green, multi-colored onesy will replace the whale in my nightmares. As I type this, I am currently in the middle of the second season of RuPaul's Drag Race, and nothing I have seen there compares to the tacky nightmare that was the costuming in this episode. Matthew: The production was pretty brutal here. All of the usual suspects rear their ugly head - rubber rocks, terrible outfits, a litany of HIDEOUS wigs, ridiculous optical effects (the "giant" cat), and the puppetry reveal at the end. Wow. Absolute train wreck. Kevin: I actually think the three witches were the worst for me. It looked like someone glued oatmeal to their faces. Matthew: I didn't like the lighting or the set designs. Everything was dark, lifeless, lacking in the color of most TOS outings. Only the scenes on the ship really pop in the way TOS should. It was a drag watching this, even in 1080p on Blu-Ray. On the plus side, I want that die-cast Enterprise miniature that Sylvia does her voo-doo on. That thing was sweet. Matthew: I have to go back to the criteria for this one. It may just rate a 1. It was significantly sub-par in two of our three categories, and the acting didn't really leap out either. I do think it would require significant alcoholic consumption or jeering to enjoy fully. It's certainly in the bottom ten percent of TOS episodes. So I'm sorry, Sylvia, but this turkey gets a 1 from me. Definitely near or at the bottom of the TOS barrel. Kevin: I agree. This is a flat one. Trying to decide what is worse, this or The Apple is the world's worst game of "Would You Rather...?" That makes a total of 2 from us. Now if you will excuse me, I am going to go find a Q-tip for my brain and try to remove any memory of this episode. You know... I think the Smithsonian has that die cast Enterprise miniature in their collection. I think I saw that fact of some Star Trek documentary hosted by Leonard Nimoy. On the Biography channel, maybe? Yup. 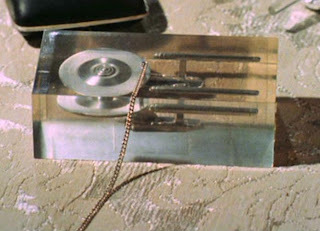 Memory Alpha confirms, "A detailed metal prop miniature of the Enterprise was created for this episode, then laminated in lucite as one of Korob's tricks. The miniature was donated to the Smithsonian National Air and Space Museum by Gene Roddenberry."